Travel from Ocracoke Island to Duck and taste some of the most delicious seafood North Carolina has to offer. 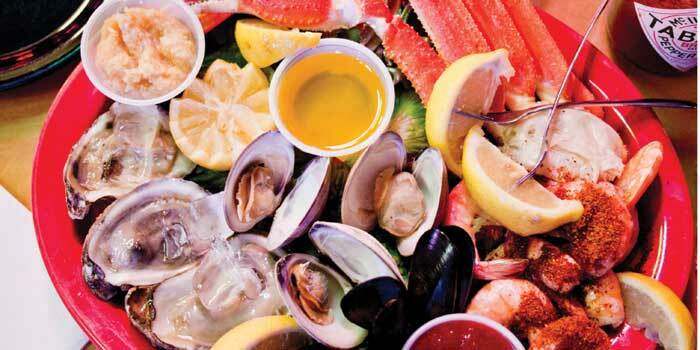 Along the saltwater edge of North Carolina, we have seafood. It’s in shacks, in stores, in dining rooms. It’s everywhere. There’s no way we could get to it all, but we tried. We sent a writer and a photographer on a three-part, south-to-north drive that took them on beach roads and ferries and fishing piers. They traveled 250 miles. And everywhere along the way, they ate. After the 22-mile ferry across Pamlico Sound, our first stop on remote Ocracoke is Howard’s Pub. Open since the late 1980s, it looks like a rambling, wooden beach house on the outside. Inside, above the wooden booths and tables, college pennants, surfboards, and license plates fill the walls. It’s a comfortable place to sit, and we order conch fritters to start (big chunks of conch and a sauce with a peppery kick), and then The Works, a seafood combo of oysters on the half shell, peel-and-eat shrimp, steamed mussels and clams, and a cluster of steamed crab legs. We continue driving north, and N.C. Highway 12 still looks rough in places. Some of the tallest dunes have been windswept and washed over, and the multicolored, temporary bridge rumbles beneath the car’s wheels. In Nags Head, Mike Kelly works in his office in the cavernous Kelly’s Outer Banks Restaurant and Tavern. Art and memorabilia from the Outer Banks cover the walls throughout the dining rooms. He points out an 1884 black-and-white photo of men seining for jumping mullet, a whale vertebra “brought in from a guy at Stumpy Point,” and a “practice bomb” recovered from the World War II firing range in Duck. Dinner won’t be served for a few hours, but Mike gives us some just-made sweet potato biscuits for the road. Kelly’s biscuits are a specialty, and he says the four-ingredient recipe — sweet potatoes, brown sugar, water, and biscuit mix — was given to him by the cook at a hunting lodge in Currituck County. We head toward Currituck Sound, but first, we make a stop in Southern Shores. A popular gourmet food and wine store, Coastal Provisions, opened an adjoining outdoor oyster bar last summer. And it has a reputation for serving a whopper of a crab cake sandwich. One of the owners, Dan Lewis, explains that the crab cakes are made with lump and jumbo-lump crabmeat and a base of Dijon mustard, mayonnaise, bread crumbs, and spices. “We’re purists and don’t add green peppers or other fillers,” Lewis says. “We think the crab should taste like crab.” A local customer liked the sandwich so much that he began ordering a double (two crab cakes on a bun), and now the hefty Kevin’s Ultimate version is also a standard on the menu. The final stop of the day, and of this mouthwatering, shore-following driving tour, is at The Left Bank restaurant in Duck, part of The Sanderling Resort. It’s a smooth finish. The elegant, curved room of windows facing the Currituck Sound is furnished in colors of Cognac and cream, and delicate bird sculptures are displayed on glass shelves. The food can look like a sculpture, too. One of the dishes on the tasting menu concocted that night by Chef de Cuisine Travis Lee Robinson consists of a single Rappahannock oyster in a gleaming, porcelain white shell, topped with white lychee sorbet, hackleback caviar, and a tiny sprig of Thai basil. It’s gorgeous and delicious. With no wall between the kitchen and the dining room, we watch the food being prepared. As at so many of the places on this coastal drive, in North Carolina, it is a place for people who simply and genuinely love the ocean and the seafood that it brings. A fan of seafood and road trips, writer Sandy Lang is based in Charleston, South Carolina, and she’s a contributing editor for Charleston Magazine and Maine magazine. Her most recent story for Our State was “Gimme Some Sugar” (February 2012).